Skaro was the homeworld of the Kaled and the Thal civilizations, and was devastated by their Thousand Year War. It was during this conflict that Davros created the Daleks, who took Skaro for themselves. The rest was history...and the present...and if they have their way, the future. All participants will get this amazing 3.5" medal that reveals what is underneath that hard Dalek exterior! Half the medal is metal, but the Dalek is squishy PVC rubber! (Life support encapsulation slime for the Dalek not included, because that's gross.) Of course, it comes with the custom satin ribbon and the always popular custom digital bib. "Do you want to build a Dalek?" Hopefully not...Davros taught us that terrible lesson. But there are teenagers who dream of becoming scientists and engineers who can architect and build our future for GOOD...if someone would simply give them the chance. 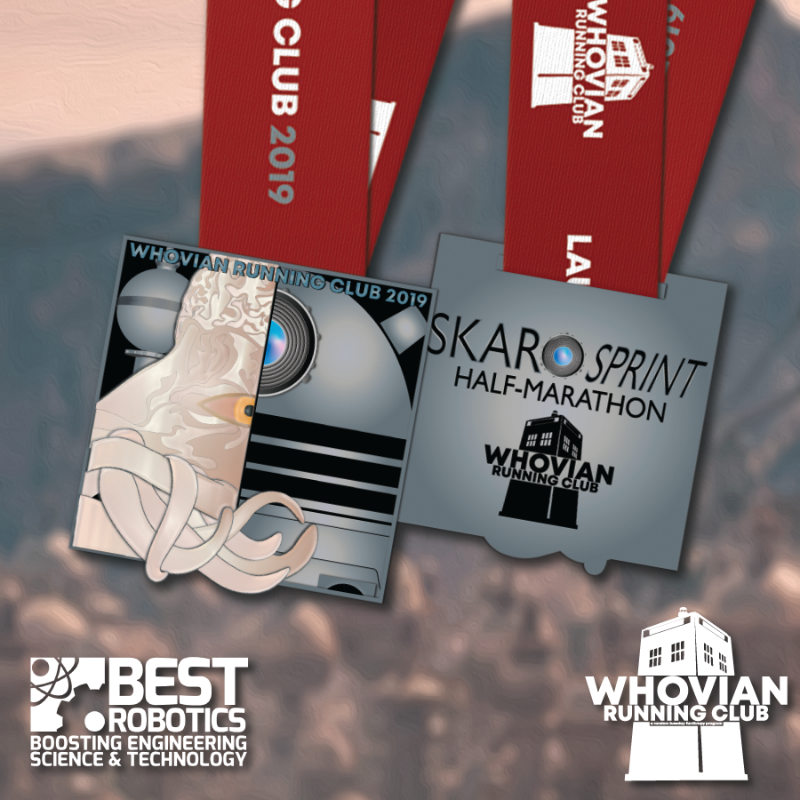 Whovian Running Club is thrilled to announce that our charity partner for this event is BEST Robotics! BEST Robotics is a national nonprofit that provides STEM Education for workforce development through a FREE after-school program and competition for students in middle and high school. The proceeds from the Skaro Sprint will help fund young robotics engineers, and lead them to a local competition where mentors and volunteers help lead them to an incredible future! "Something old, something new, something hateful, and a plunger too!" Don’t forget to get your event shirt! What do you get when you combine a large salt shaker, a whisk, a plunger, and a malevolent squid? Well...you get the idea. 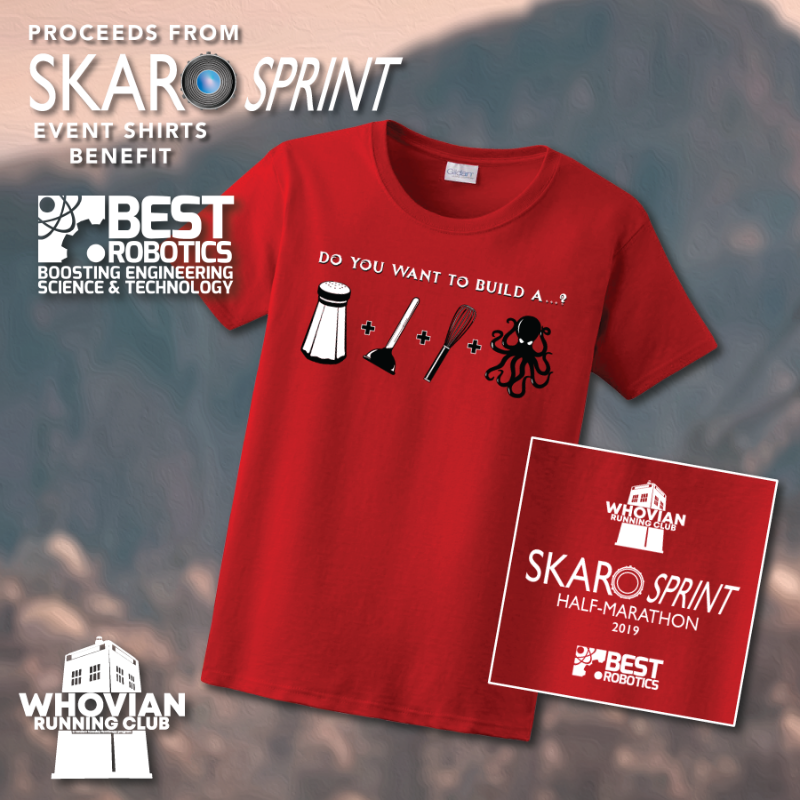 Get your awesomely evil Skaro Sprint shirt (available in tees, performance tees and tanks, and even hoodies) and all of the proceeds will go to BEST Robotics! The suggested run date for this event is April 27...Jenna Coleman's birthday! (She had her share of interesting experiences on Skaro, so it's only fair!) Remember, this is just a fun suggestion. Being a virtual run, you’re welcome to complete your distance whenever, wherever, and however you choose. All medals will be mailed the week after registration closes. For more information on how our virtual running events work, please visit our FAQ. ﻿Sign up TODAY and Let's Build the Future!